Canyon Journey, a short chapbook, poetry by Judith Wilkinson, artwork by Ditty Doornbos, Shoestring Press, 2016.
tried to engage actively with this material and keep a record of it. Many years later they decided to collaborate on a chapbook. Some of the poems were sparked by Doornbos’s artwork, some of the artwork was inspired by Wilkinson’s poems. Wilkinson based her sequence on the dream imagery of Doornbos’s journey, in which the central image was a desert canyon that started out as an ominous landscape and evolved into a place of regeneration. ‘Prior to this, Judith Wilkinson was familiar to me only through her translations of the Dutch poet Toon Tellegen. This sequence confirms the status of her own work. It joins the ranks of books about surviving and how to survive and it is her attentiveness to language that makes it memorable.’ D.A. Prince, London Grip. 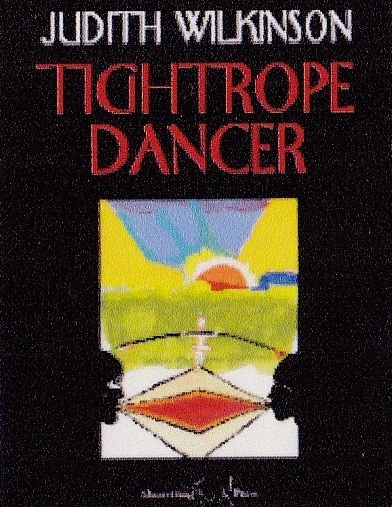 Judith Wilkinson, Tightrope Dancer, Shoestring Press, 2010. Cover painting: Eva Spakman. Tightrope Dancer is Judith Wilkinson’s first collection of poetry. 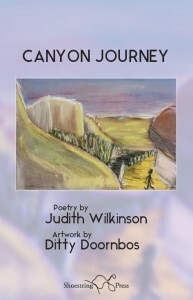 Its title poem explores a woman’s journey within and beyond a relationship that is as creative as it is destructive and leads her to question the nature of the art that has inspired her. Language itself walks a tightrope here, inviting the reader to fill in the gaps between the stanzas, with their shifting points of view. Following a number of poems written from a perspective of solitude, the collection moves on to the paradoxes of another relationship, one that is both intimate and distant. The final poem celebrates a woman’s attempt to redefine herself. Two long poems performed throughout Britain and elsewhere by the London dance-theatre company The Kosh. The two dances, Circuit Breaker and Upstart, have been performed separately and as a double bill entitled Just Below the Surface. 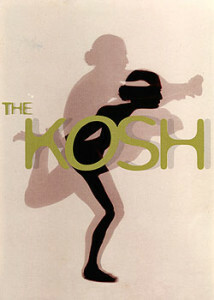 A film of the two dances is available via www.thekosh.com.